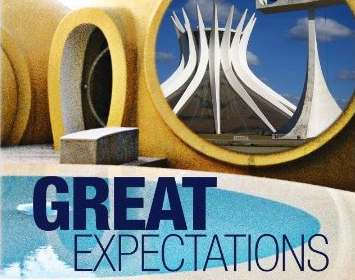 Great Expectations introduces us to the most significant architectural movements and personalities of the 20th century, including, among many others: Le Corbusier's functionalist cities, Buckminster Fuller's lightweight geodesic domes, Moshe Safdie's Habitat '67 prefab apartments, Rudolf Steiner's Goetheanum and other anthroposophy buildings in Switzerland, Oscar Niemeyer's sleek urban designs for Brasilia, Paolo Soleri's "archology" of crystal-like desert cities, Antti Lovag's curved surfaces of Palais Bulles in France, Jacque Fresco's utopian Venus Project in Florida, and Peter Cook and Colin Fournier's biomorphic Kunsthaus Graz in Austria. Using archival and contemporary footage, animation and interviews, Great Expectations tells the fascinating story of these grand architectural visions, both realized and unrealized, as explained by great thinkers with revolutionary, if not always successful, ideas. This event is open to the BAC community (current students, staff, and instructors) and is sponsored by NOMAS. Popcorn will be provided.